Only on Concert.ua during the whole month (01-30.04) catch discounts for concerts, festivals, parties and plays. But that's not all! 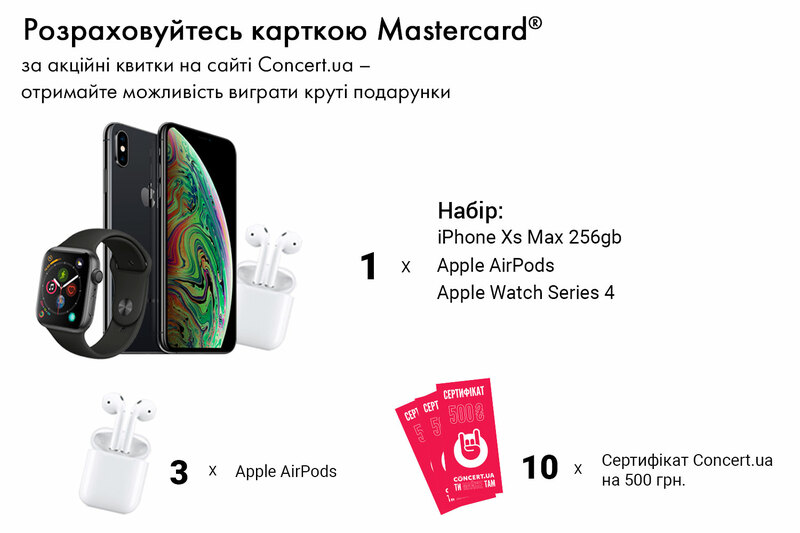 Among the buyers of promotional tickets paid on the site by Mastercard, EVERY WEEK we'll draw winners of one set of iPhone Xs Max 256Gb + Apple Watch Series 4 + Apple AirPods, as well as 10 Certificates Concert.ua for 500 UAH. and 3 Apple AirPods. The winners are determined by random selection using random.org in 4 stages among the buyers of promotional tickets paid by Mastercard on Concert.ua website in the following periods: April 1-7, April 8-14, April 15-21, April 22-30.